Ranil meets MR- A coffee morning? Opposition leader and the leader of the United National Party (UNP) Ranil Wickramasinghe called on President Mahinda Rajapaksa at Temple Trees this morning on 14 May, a Senior Spokesperson from the President’s Media Unit said. Ministers Maithreepala Sirisena, Nimal Siripala de Silva, Susil Premajayanth, Basil Rajapaksa and Dallas Alahapperuma have joined the discussion representing the government. The United National Party was also represented by Tissa Attanayake, John Amaratunga, Joseph Michael Perera, Ravi Karunanayake and Lakshman Kiriella. A reliable source stated that the special meeting was held on obtaining the oppositions’ representation for the Parliamentary Select Committee (PSC). It is also learnt that the discussion focused on the PSC on reconciliation and the implementation of some of the LLRC recommendations. At the meeting the Opposition leader has handed over the ‘UNP strategy’ a recommended formula to the government for the creation of a favourable political climate for the Tamil National Alliance (TNA) to join the proposed Parliamentary Select Committee, informed source further said. 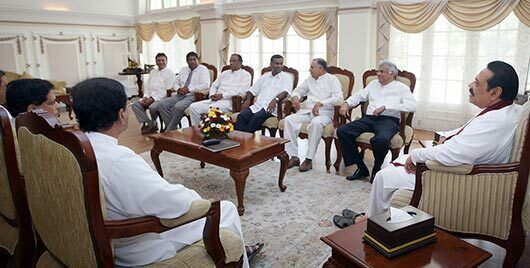 Pictures are seen here two leaders, ministers and the UNP representatives in conversation at Temple Trees. 1 Response to Ranil meets MR- A coffee morning? UNP HORU TIKA RAJA MEET WENNA AWITH WAGE.HONDATA KATA KARALA PASSE MAHINDA SIRTA BANIWI.